Café de Paris is a family restaurant and bakery, one of the top in Nosara for breakfast and lunch. We offer a variety of activities like mini golf, swimming pool and a lounge area, along with our famous fresh bread and pastry. We are located on the road to the beautiful Guiones Beach, surrounded by nature and ocean breeze. It is said that the best things come unexpectedly. In 1994 Martine and Thierry planned a trip around the world without knowing that, along the way, they were going to find their home. 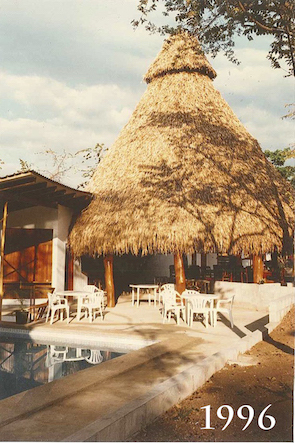 When they arrived at Nosara they knew it, this was the place. They didn’t planned to live abroad when they left their country, but Nosara has that sort of magic. Back in 1994, Guiones Beach was a whole different place. After decades of being used for cattle, the forest was just starting to regenerate; there was a very small community and most services were not available. But Martine and Thierry knew this was to be their home, so after a year of struggles, they opened Café de Paris. That was their way of bringing a piece of their french culture to this tropical paradise they found, a way of bringing together the best of both worlds. And of course, having fresh bread everyday. Since then, Café de Paris has grown to a lounge styled restaurant and bakery. Always maintaining their characteristically conic “rancho”, a homage to the local indigenous culture. We opened the bakery so we could have fresh bread everyday and share it with others. Now with the help of bakers Damien Sauvageat and Johana Bermúdez we have the possibility of bringing the best of Swiss and Costa Rican experience. A member of the renowned Chaîne des Rôtisseurs, Chef Julián Rojas is passionate about cooking. His dishes show a lot of his experience. Being Costa Rican he brings with him the essence of his country along with a touch of peruvian cuisine that he learned in the Institute Le Cordon Bleu. And of course an innovative approach to international cuisine.